Fr. Leopold is the world’s smallest priest! Have you heard that you can get a Legos Mass set? You can even change Fr. Leopold’s vestments for the liturgical seasons! This is a fun way to ‘practice’ Mass. Too simple for you? Are you to ‘big’ for a set with only 174 pieces? Last year, a priest displayed a pretty impressive Lego project at the Franklin Institute in Pennsylvania. About 500,000 Legos later, Fr. Bob Simon had created a replica of St. Peter’s Basilica at the Vatican in honor of Pope Francis’ visit. It is 14’ x 6’ feet and took more than 10 months to create. He said it was a prayerful experience to build. Another fun fact: He tried to create St. Peter’s Basilica when he was 7 years old and was sure he wanted to be a priest then, too! According to Fortune and Wired, it would cost about $50,000 to make! How many Legos do you have? Can you ‘build’ your faith? What would it look like? This entry was posted in People you should know and tagged basilica, build, faith, Father, Legos, liturgical, Mass, Peter, prayer, season, vatican, vestments. 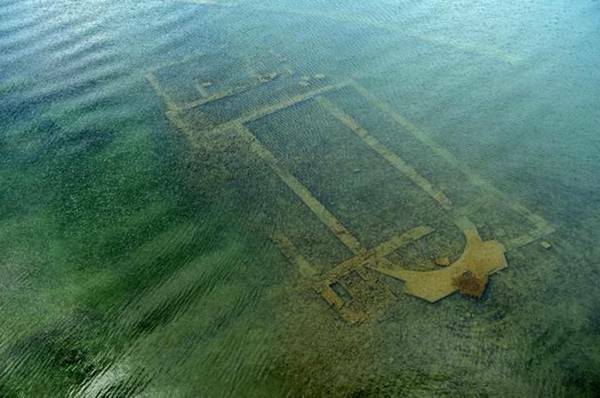 An ancient Basilica under Water! This entry was posted in Did you know? and tagged basilica, church, Nicene.